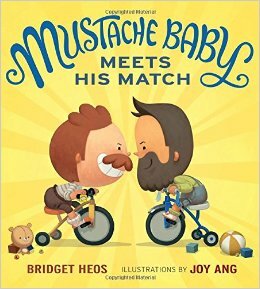 In this hilarious sequel to Mustache Baby, Billy the Mustache Baby encounters somes stiff competition when the bearded baby Javier comes to town. Wanting to be the top tot, Billy shows off his impressive skills to Javier. However, Javier has his own set of talents, and starts to outshine his rival. As their anger grows, their respective facial hair begins to take on villainous appearances, reflecting their worsening behavior. Their escalating competition culminates in an ultimate luchador-style smackdown. I think this book has humor that can be appreciated by both children and adults (regardless of facial hair status). If you don’t have a kid in your life to read picture books to, pick this title up anyway!